Champions are always happy to say that there is no place like home. This is especially true when, for whatever reason, they find themselves out in the big Elsewhere. Frequent phone calls back Home keep distant Champions informed: The flooring is down on the new porch on the Replica of the Historic Emporium on the North Side of the Square in downtown Champion. The sill is up to accept the roof and the porch posts are cut off at the appropriate height. By the time the roof is on the porch, perhaps all the wandering Champions will have clicked their ruby slippers and will be there to see it. “Home is where the heart is,” they say. They say “Why did I leave my home on the farm to look for a job in the town?” It is good fortune that does not currently require a job in the town and it will be better fortune to see the dear old place again. Dale and Betty Thomas will be hosting their wonderful Pioneer Descendents Gathering on the week end. There will be flint knapping, archery demonstrations, blacksmithing, soap making, molasses making, and apple butter. The horse drawn cycle mower is always a crowd pleaser and the wagon rides down along the Bryant are a chance to get lost in the wonderful past. Those buckskin people will be there as well as the Civil War reinactors and black-powder folks. There will be lots of live music and great food to go along with Dale’s wheel-right demonstrations. Probably the Older Iron Club will have some interesting exhibitions and, of course, Bob Berry will have his beautiful Studebaker in the antique car show. The whole thing is well worth the trip down past the Edge of the Earth, just past the Yates Cemetery. New vehicles do not have any trouble in negotiating the road. It only makes a person wonder how it must have been when those pioneers first got started down there. Betty will have a quilt to raffle and the work that the two of them do all year to get ready for this wonderful event will be clearly evident. It turns out that the world is a very connected place. Some people in the big towns cannot go anywhere without their phones. They use them to read books, send e-mail, to text, to look at pictures, to take pictures and video, to listen to music and even every once-in-a-while to talk to each other. It is easy to forget a time when the neighbors were the people with the only telephone around. It is easier yet to forget about those pioneers getting on the wagon train and leaving family and friends with the prospect of never seeing them again. These are different times. Now, when connections get missed, it is easy to imagine all kinds of things. Champions in distant places will just figure their Champion friends at home are out in the garden working, or are over at the neighbors having supper or gone to town for groceries. A couple of missed phone calls is no reason to worry. Someone said that worry is just a negative prayer. Champions do not do that. Parents and spouses and children of the U.S. Military Service people off in the dangerous parts of the world have that anxiety as a constant companion. Love and Gratitude is due them and their loved ones who are so far away for such a long time. Champions do sing, “Show me the way to go home. I’m tired and I want to go to bed. I had a little drink about an hour ago and it went right to my head. Wherever I may roam-over the land or the sea’s bright foam, you can always hear me singing this song-Show me the way to go home.” This turns out to be the bedtime song of a certain little Champion granddaughter. She said that when it rains while the sun is shining, there is always a rainbow. So far she has been proven right. Step on down to the Loafing Shed on the West Side of the Square in downtown Champion and postulate any worthwhile theory. Defend it or be proven wrong. Sing it right out loud and send your favorite bedtime song to Champion Items, Rt. 2, Box 367, Norwood, MO 65717 or to Champion News. The Loafing Shed has proven to be a valuable accommodation to Champions while things have been flux. Soon enough it will be redundant and then it will be a garage! Change is one of those things that is always very well done in Champion—Looking on the Bright Side! Champions are in the charming situation of living in a place that other people admire. One of the Champions at the recent School Reunion was heard to say, “I spent twenty years trying to get out of Champion and the next forty trying to get back.” It seems that Champion is what a lot of people think of as idyllic…charmingly simple in its pastoral scenes. First time visitors to Champion are captivated. To them nothing seems ‘different’ because they have no history with the place. Still, they find it lovely. It was interesting to see how the wagon train felt about the Champion changes. Mostly it was just done with smiles and sweet old stories about Ed Henson in the Old Store. Good inspection of the construction site by many netted approval in that it is entirely sturdy and built with much local lumber, milled with an appreciation for how well the last building made of local materials held up in that spot. The porch will tie it all together and it looks formidable! Champions’ own Harley and Barbara will be in town for a spell…always too short a spell and always welcome. Before they leave, the porch will be on the Replica of the Historic Emporium and patrons will be looking to vacate the now comfortable Loafing Shed for the more prominent spot on the porch. “All the word’s a stage!” Moreover, as the official Reviewing Stand, all Champion Parades will perforce be routed down the Broad Expanse of Lonnie Krider Way from West to East or from East to West. Either way spectators from the porch will have a perfect view! Champion. Ethel McCallie did not make it over to Champion during her stay in the area. The Haden Family Reunion in Ava was her destination and it must have held her interest so well that she could not break away. Champions hope she had a good time and that she will get back this way soon. Champion’s friend, Darrell Haden, has been much in Champion thoughts lately, with best wishes and fond remembrances. The approach of Fall brings the Headless Cobbler to mind. A Champion friend from Vera Cruz made that trip over to Branson on the 11th to the White River Valley Electric Co-Op gathering and found it to have been a good experience. She had questions concerning solar power and ways to determine high usage times so that she could arrange certain of her activities during times that are not peak usage hours. Champion kinds of cooperation are always coming to light! Autumn begins on Wednesday, though there may still be some nice summertime weather. Linda’s Almanac from over at The Plant Place in Norwood says that root crops can be planted on the 27th and 28th. It might be time to start thinking about putting in some spring bulbs. There might still be time for some beets and turnips! Everybody will be looking for Lem and Ned to come clean up the garden when it is finished. Some old Champions say that this is going to be the year when they don’t just let the garden go for the winter. Those old people will need some help. Sometimes talking about gardening is as much fun as doing it. Now that Linda and Charlene have such a comfortable and warm space it looks like some card games and extrapolated visiting will take place in that bright place with all the lights and windows. Arlene Cooley is still talking about Charlene’s painted bird house that was her door prize at the Champion School Reunion. An e-mail came from Pete Proctor with a link to the story of the POW/MIA Color Ceremony and Missing Man Table. “The sun was shining bright as the Comrades, Sisters and guests gathered on the Mountain Grove Public Square before 9:00 a.m. on Friday, September 17, 2010 for the POW/MIA Awareness Day Color Ceremony. There were twelve Comrades of Mountain Grove VFW Post 3770, six Sisters of the Ladies Auxiliary and fifteen guests attending the event.” There are pictures and much more information at POW/MIA Color Ceremony. Look for a new Link to the VFW Post 3770 website in the Links Category at www.championnews.us. Look for any opportunity to express Love and Gratitude to those serving Our Nation in and out of uniform. They are Champions and they have it coming. Champion Elmer Banks had a birthday on Wednesday, the 15th. He was just so happy to have made it another year he forgot to tell his age! He really enjoyed the wagon train and meeting some newcomers to the area. There are a number of people with birthdays coming up. Louise Hutchison celebrates on the 21st of September as does Miss Zoey Louise and Penelope Zappler, both of Austin, TX. Champion Rebecca Heston (winning bidder on the July Mascot Monkey of the Month for the benefit of the Skyline VFD Fire Truck fund) will celebrate on the 29th. Skyline Auxiliary President, Betty Dye, will celebrate on the 7th. Taegan Rae Krider’s old man will have a birthday on the 14th of October. He had a good time at the wagon train particularly teasing Jackie Coonts about what a ferociously ugly horse he has. His point was that Jackie seems to think it is a beautiful horse. He puts a lot of time in the saddle, so he should know. Donna Moskaly up on C highway will have a birthday on the 20th and many will remember Ana Henson’s birthday on the 21st. Ana’s sister-in-law, Ms. Maxine Grote, was in Champion for the School Reunion. Then Harley Krider will have his birthday on the 26th and will once again be older than his contemporaries. He is such a sport! “Quite a golfer,” they say. One Champion will leave home on the day Harley arrives and will stay away from her favorite place in the world until he is gone again. It is not at all intentional—just a coincidence and so all the teasing that could have resulted from having heard Hovey and that crowd talk about Champion boyhood days will have gone for naught. Champions always feel like there is plenty of time for that kind of fun. “You can’t jump across a chasm in two leaps.” That is a Champion Thought. Think up such a thing as that and send it to Champion Items and Rt. 2, Box 367, Norwood, MO 65717 or to Champion News. Sing the second and third verses to the Happy Birthday Song out in the Loafing Shed to anyone who will sit still for it. When the porch gets into regular use by the public, there may be some rules of decorum to observe. For now, however, it is Champion! Looking on the Bright Side! Champions are a helpful and generous people. One took the opportunity to help the builder unload a few boards the other day and now can strut about saying how he has been ‘helping’ to build the Replica of the Historic Emporium on the North Side of the Square in Downtown Champion. Patrons of the Temporary Annex over on the West Side of the Square are pleased with the progress of the Replica and particularly with the perfect placement of the pads for the porch posts. Soon the porch will be there and it is to be hoped that the steps will be the last to go up as a way to keep out the gawkers. So far the building has not been too overrun with nonparticipating observers because it has been rather inaccessible to all but the nimble, but once the steps go in it might be a different story. The superintendent is accustomed to handling all types of delicate situations, so no conflicts are expected and progress should not be overly affected. There will be explanations about how the new roof will be a “three-way” rather than regular shed roof on account of the relative ceiling height and the like. It will go on and on—Champion! Champions are more familiar with the “three-way” being a harness of three mules pulling a wagon like the Webster wagon with Candy, Kate and Joe that came through last year. Champions are excited that the Wagon Train is due through town this week. If it runs according to schedule, it ought to be pulling into Champion in the neighborhood of noon on Thursday. This is The West Plains Wagon Club led by Clifton Luna. The club makes the annual trip to Mansfield starting out from West Plains on Monday morning. They travel about twenty miles a day and make camp each evening at their regular spots along the way. They will arrive in Mansfield on Saturday in time for the Wilder Days Celebration. Last year there were eleven wagons of various descriptions and the community turned out to give them a good examination. They seem to enjoy the attention, so it works out well for everyone. The travelers will have some surprises in store for them when they roll into Champion. A week after the Champion School Reunion, Hovey will be pleased to know people are still talking about him. The various versions of the stories about the mailbox, the still, the hollow log, the boys in trouble and trips into town to see the judge are all remembered differently according to whether the rememberer was an actual participant in the alleged shenanigans or the recipient of some exaggerated hear-say third hand and in the way distant past dredged up now from fading memories tinged with the rosy glow of nostalgia. So much of history trickles to the surface through these murky channels. Hovey said that he was interested in responding to Wally Hopper’s note about the history of Denlow and how he would like to have an historic marker there. Hovey agrees that the place has fallen into significant disrepair. He is also wondering if there is a marker that actually marks the spot known as Vera Cruz. Inquires confirm that there is such a spot and it is on the farm of a Mr. John Vineyard. Do-gooders and busy-bodies will spend some time getting the two of them together so the Champion’s concerns can be relieved. The coyotes howled around the intrepid campers and the young folks drifted off to sleep to their music. Roasted marshmallows and ‘smores’ were evening delights and pancakes on the camp stove in the morning will be long remembered and expected on future outings. No alligators crept up out of the pond and no bears came down out of the woods to trouble the happy campers and Mom and Dad were right there to be sure of it. Foster and Kalyssa are already building a set of good childhood memories. Their little cousin, Taegan was quite entertaining on Sunday showing everybody that at four months old she is just about ready to take off crawling. She will soon get that knee up under herself and then she will be going where she pleases. Old folks wonder if they are changing as quickly as the little ones do. 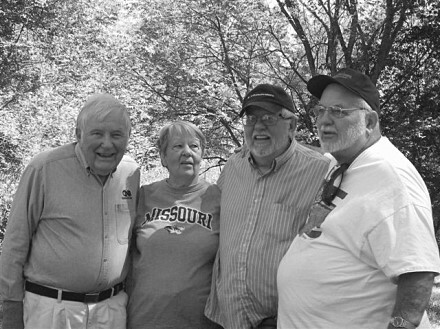 The General spread the largess of his attentions around to the Brixey Family Reunion up in Seymour on Saturday and so missed the four Henson siblings at the Champion School Reunion. More is the pity. They missed him! The Brixies must have had advanced warning that he was coming because the numbers were down a little. The General’s lovely sister seems to be related to everyone in the area some way or another and so it is reckoned that he is too and for that reason has some degree (for want of a better word) of ‘welcome’ at almost any family gathering in these parts. There has been no recent news of the marauding goat of Vanzant. It has spent time on Esther’s porch, napping and nibbling the flower buds off her Christmas cactus and making sudden lurching exits from her garage. It takes a lot of seasoning to disguise the taste of goat once it reaches a certain age. These things are best left in the capable hands of the General himself. This may be the soirée to which certain Champions are finally invited, though no breaths are being held. Noses will be, though—goat tacos. Yum. The signs have changed and so that the 15th through the 17th will be good days to plant above the ground crops. Some spinach and any kind of leafy greens can go in about this time and will most likely have time to make. These things can stand some cold weather, and it may happen that they get some before long. The seasons are going by quickly. Linda’s Almanac has a lot of good information. It will soon be time to start bringing in those delicate things that will need protection through the winter. Linda has some nice fall cabbage and broccoli plants and lots of good advice for novice gardeners and experienced ones. “Rolling, rolling, rolling! Keep them wagons rolling. Though the streams are swollen, Rawhide! Through all kinds of weather, what if the sky should fall? As long as we’re together, it doesn’t really matter at all.” One old Champion tells another that this song is about ‘doggies’ not wagons and the rest of it is part of a song called “Side by Side.” The song the Champion is looking for is “Wagon Train, Roll along. Rolling over prairie where there ain’t no grass. Rolling over mountains where there ain’t no pass. Sitting on the board, eye in the weather, praying to the Lord we stay together side by side on the wagon train.” Sing that one out in the loafing shed while you still have the chance. Get down to the Square on Thursday to see the wagon train or just come anytime to Champion and Look on the Bright Side! The first Champion School Reunion was held in 1984. They have been going strong ever since. Attending this year: Robert and Connie Brown, Ivel Brown, Pete Proctor, Eva Henson Phillips, Tommy and Barbara Sutherland, Jerry and Shauna Smith, Fae Krider, Charles Lambert, Hanna Faith Jensen, Ruby Proctor, Barbara Proctor Cooper, Darrell Cooper, Elsie Curtis, Debbie Massey, Lonnie Curtis, Tom and Arlene Cooley, Robert Graham, Mary Graham, Gary Hutchison and Phyllis Long, Vivian Floyd, Irene Dooms, Verla and Lonnie Mears, Betty Henson, Carolyn and Darrell Hutchison, Jordan Hutchison, Esther Wrinkles, Elva Ragland, Larry and Teresa Wrinkles, Amy Collins, Sheila Collins, Pete Robertson, Maxine Grote, Darrell Cooley, Eric Arnall, Sue Arnall, Leola Bell, Modeen Dooms McGown, Royce Henson, Carol Coats Barnhart, Peggy Hancock Carreras, Randy Henson, Wayne and Fances Sutherland, Laine Sutherland, Greta Cope, Russell, Sue and Dean Upshaw, Leslee Krider, Staci and Dustin Cline, Kenneth and Dawn Henson, Dale and Betty Thomas, Kenneth and Barbara Anderson and Barbara’s daughter Jonna. There were others who asked not to be named and some who came made only a cameo appearance. 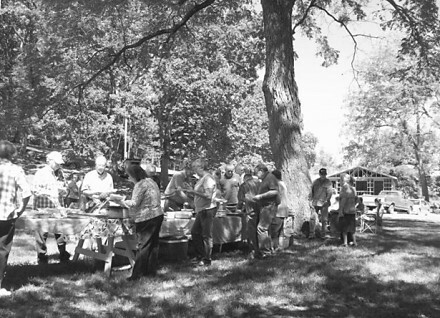 Long tables of homemade pot-luck dishes were spread out under the trees by the Champion School on Saturday. Champions feasted on the delicious food and on the excellent opportunity to get together for some good old fashioned visiting and reminiscing. The framework of the Replica of Henson’s Store is seen in the background. Three daughters of John and Goldie Hicks who attended the Champion School together enjoyed the School Reunion on Saturday. 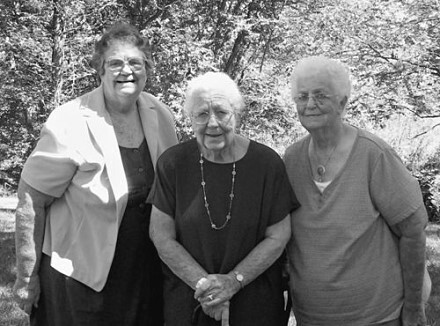 They are Elsie Curtis of Norwood, and Ruby Proctor and Amy Collins both of Mountain Grove. Their sister, Sharon Smith, also lives in Mountain Grove and they have a brother, Ray Hicks, who lives in Bluegrass, Iowa. Their older brother, Gene Hicks, lives in Baker City, Oregon. He is in poor health at this time and his siblings are all thinking about him. John and Goldie had ten children and lived just up Fox Creek from Champion. Some of the younger ones attended the Bakersfield School, but the older ones were all Champions. The School Reunion is always high point in the year for them. Arlene Cooley won this painted gourd birdhouse as a door prize at the Champion School Reunion on Saturday. It was painted by Charlene Dupree of The Gift Corner in Norwood and was presented to her by Miss Hannah Faith Jansen, visiting granddaughter of Champion Charles Lambert. Hannah will be five years old in December and this was the first Champion School Reunion that she has attended. Arlene never misses one. She is a Champion. 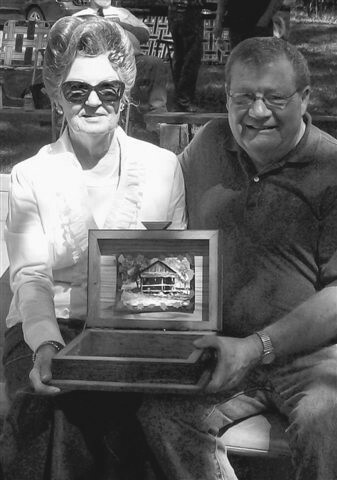 Vivian Krider Floyd and Jerry Smith are shown here with the treasure chest that Jerry made from the recycled lumber of the Old Store. He donated the piece to help perpetuate the Champion School Reunion and Vivian bought it in a lively auction conducted by classmate, Kenneth (Hovie) Henson. Jerry planed the old lumber and made the box as well as a number of picture frames in his shop in Seymour. The inside lid of the box features a picture of the Old Store and Jerry had a number of requests for pictures of the store framed in its own wood. Champions treasure a good memento. The children of Ezra and Sylvia Henson all attended the Champion School and the Champion School Reunion this year. They are Royce Henson, of Springfield, MO, Eva Henson Phillips of Bellavista, AR, Kenneth Henson, of Houston, TX, and Randy Henson of Columbia, MO. This is the first time they have all been together at the School Reunion and there were many stories told and much laughter. Ms. Leola Bell of Stoutland, MO taught school in Champion in 1953. This year she was the only teacher attending the Champion School Reunion who taught there. Ms. Bell began teaching when she graduated high shcool and taught in rural schools while she finished her tcollege degree. She taught for forty five years and retired from the Waynesville School District. Her grandddaughter, who attended the reunion with her, said that she is still substitute teaching. 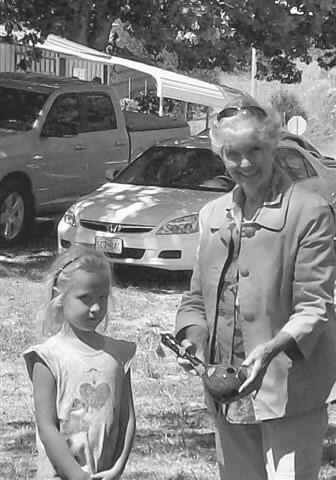 She was presented with a gift by the Reunion Committee and enjoyed reminiscing with many of her students. This was a nice crowd. It was said that there were more first time attendees here this year than in any other. There were sixteen teachers at the first reunion. This year Ms. Leola Bell was the only one. She grew up over on Highway 14 near Fox Creek and began teaching in Champion when she graduated from high school. She had a long distinguished career as an elementary and high school teacher, an elementary school principal, and as a special education teacher. She lives over by Lebanon now and still substitute teaches. She had good Champion beginnings. Among the things over heard at the reunion: “I spent twenty years trying to get out of Champion and the last forty years trying to get back.” “Little, Elvie, did you ever find your shoes? I threw them in the creek and got a good beating for it. They might be in the Atlantic Ocean by now.” “It’s so good to see you!” “Do you remember that dog show they had down here one time? The dogs were jumping through hoops and turning flips. They had a horse that could count. I was in about the first grade. Now, I thought that was really something.” The amount of yarn spun on Saturday could knit knickers for half of Douglas County. S.C. Turnbo could certainly have found things to write about. A certain Mr. Phillips receiving some well-warranted sympathy over the luck of the draw of his particular bunch of brothers-in-law quickly turned the subject to Turnbo’s “White River Chronicles.” A good sense of humor is a Champion thing no matter where a person comes from or how they became entwined in the Champion Experience. The reunion was just the beginning of a great day for Esther Wrinkles and her family. 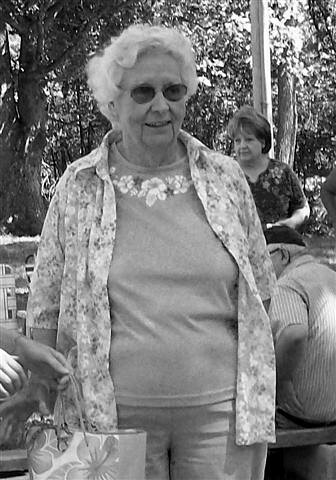 She had both her sons and their wives and her sister, Irene Dooms, and her children and a houseful of grandchildren and great grandchildren all for a birthday celebration on Saturday evening. It seems to be the nature of Champions to celebrate. The mysterious goat was still plaguing Esther’s porch and garage—eating flowers and keeping the General at bay. His absence was noted at the reunion together with comments about unreliability. Fortunately, Hovey was there to run the auction. Foster and Kalyssa Wiseman did not attend the reunion this year. They arrived after the festivities had ended. At three years of age, Kalyssa did not seem to be bothered by having had her age reported as four in last week’s paper. She and Jenna Brixie were born on the same day and Jenna celebrated her third birthday. Some Champions are getting old and forgetful, but those things only become important later on. Kalyssa was busy getting ready for a big camping trip out in her Grammy’s field on Sunday night. The family was going to camp out by the pond in a tent. Nobody was worried about alligators coming out of the pond or bears out of the woods—well, not very worried. Mom and Dad were going to be there. A short e-mail came from David Richardson to the Champion mailbox. He sent a link to a movie he made at the Skyline VFD Picnic back in August. It was well done and nice to see from the comfort of an air-conditioned computer room. Everyone will remember how amazingly hot it was at the picnic this year. In response to the thank you note, he said that he had a movie of Lonnie Krider and Wayne Anderson the last time they played together at the picnic. The song is “Once More” and it is just lovely . . .
Pete Proctor had a good time at the reunion. He said that on the 17th of September, he and Joe Kelly will present a program of the POW MIA Missing Man Table. It will be on the square in Mountain Grove at nine in the morning with the Flag raising ceremony. He said that there are still over 1700 missing soldiers from foreign conflicts. Since May there have been six names added to the Viet Nam Memorial Wall as remains of those soldiers have been recovered. The Veterans of Foreign Wars Post 3770 in Mountain Grove stays active in supporting Veterans and their families. The Love and Gratitude they extend comes from all Champions as well. The consensus of opinion concerning the Replica of Henson’s Store being built on the original spot on the North Side of the Square in Downtown Champion is that it is just beautiful. Many of those returning Champions had a little somber feeling to see such a change, but none could dispute the necessity. The vibrant living nature of the place has not changed in all these years. Someone remarked that it would be nice if the obvious changes in some of these old Champions could be like the ones appearing on the square and they could once again be sturdy and graceful. Champions are optimists but not delusional. Much praise was lavished on the absent builders. “They sure enough are doing a bang up job!” And the like. Send the like or any length yarn to Champion Items, Rt. 2 Box 367, Norwood, MO 65717. Sing “Once More” or any sweet, sad old song way out yonder in the Loafing Shed. If you have a lively, uplifting, happy kind of song, just sing it anywhere in Champion—Looking on the Bright Side.